Outdoor Furniture and Barbeque to enjoy in the summer months. Efficient Metro log burner fire for fantastic heat and atmosphere. Fully equipt kitchen open plan design, leading to a spacious lounge ideal for families. TV with Freeview reception. DVD player, Stereo. 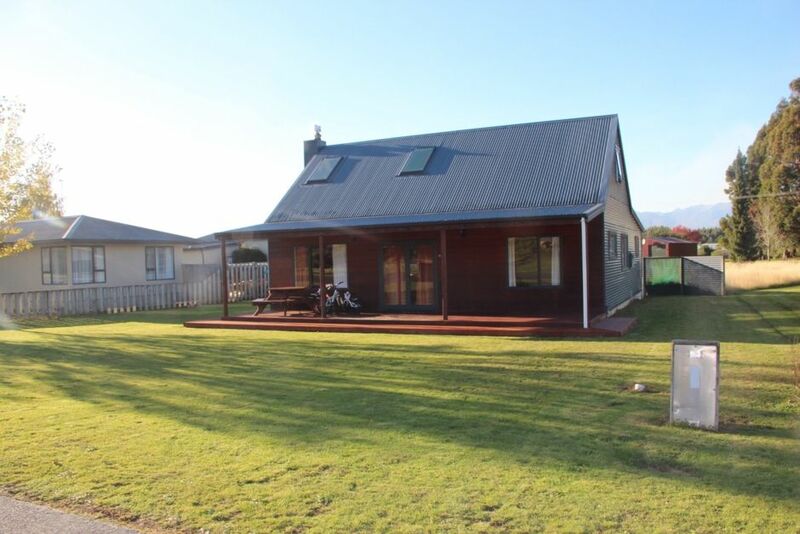 15 minute drive to Lake Te Anau (Large Supermarket, Pharmacy), Walking distance to Manapouri township (Garage, Shop), Short walk to Pearl Harbour jetty (departure point for Doubtful Sound Cruises) . Accommodates up to 6 people..
Rate applies for 2, Additional people are $10/n. Enjoyed our stay here. The house was spacious and warm. Lovely big kitchen and lounge. Only minutes from boat for doubtful sound trip. While not having a lake view it has views of the mountains & is well situated in the town, close enough to walk easily to the harbour & the pub. We found everything we needed for a very pleasant few days. Really peaceful and only a short walk from the Lake which was spectacular. Manapouri is very quiet and just what we needed - we enjoyed exploring Doubtful Sound, Milford Sound and the glow worm caves in Te Anau and all of these are accessible from Manapouri. Thanks for a lovely stay! A lovely bach with everything you need for a comfortable stay. It’s the second time we’ve been here. Comfortable and surprisingly spacious. Great house, well located and equipped. Really comfortable and welcoming. Had everything we needed and welcome pack was very informative.